sculptor, painter, and architect; b. 1480; d. 1561. Alonso was the son of Pedro Berruguete, a Spanish painter, who flourished in Castile toward the end of the fifteenth century. He studied with his father, and as early as 1503 was in Florence. Berruguete was one of the young men who formed themselves on Michelangelo's cartoon of "Soldiers Bathing," and appears to have been employed by Michelangelo at the Vatican. He returned to Spain in 1520. Berruguete lived for some time at Zaragoza, and in 1526 established himself at Valladolid. Between 1526 and 1532 he made the great wooden retable of the convent of S. Benedict in that city. About the same time he executed the marble monument of Alonzo de Burgos, confessor of Queen Isabella the Catholic, in the chapel of the College of S. Gregorio at Valladolid (now destroyed). The Emperor Charles V made Berruguete painter and sculptor of the "Camara," and intrusted him with the decoration of his projected palace at the Alhambra. He was employed at the Alcazar and Episcopal Palace at Toledo. Berruguete died while engaged upon the fine monument of the Cardinal Talavera at the Hospital de Afuera at Toledo. ecclesiastic and architect; d. 1532. The prior of S. Bartholomew, London, is mentioned in the will of King Henry VII as "Maister of the Works" of the chapel of the Virgin Mary, now called Henry the Seventh's Chapel, at Westminster Abbey, London. The actual prior at this time was William Bolton. It is extremely probable that he designed the chapel, although it has usually been credited to Sir Reginald Bray. The first stone of the building was laid January 24, 1503. The greater part of it was built in the reign of Henry VIII (1491-1547). Stow calls Bolton a "great builder." Studied in Rome, especially under the influence of Michelangelo Buonarroti. He was recalled to Spain by Philip II. His most important work is the palace of the Escorial which was begun by him in 1503 and finished by Juan de Herrera. He built the facade of the church of Descalzas Reales at Madrid, and other important works. 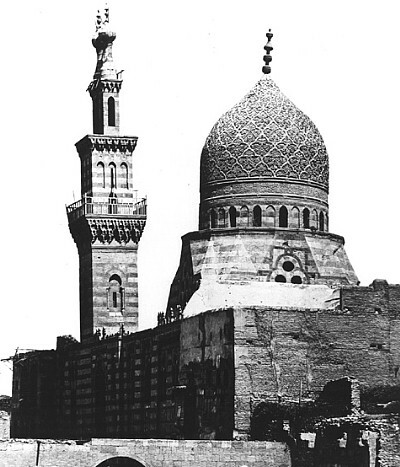 Madrasa and Tomb of Qani Bay Akhur (Cairo: 1503). 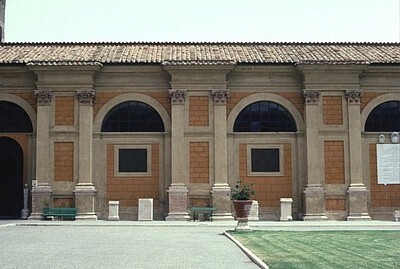 Bramante, Belvedere Court (Vatican City: 1503). Longitudinal section and general plan of the court of the Belvedere of the Vatican, represented as it was designed and partly executed by Bramante in 1503, during the pontificate of Julius II. The court was afterwards divided by an edifice which Sixtus V erected for the library of the Vatican. Part of the longitudinal section on a larger scale, showing the detail of the orders which decorate the four stories of this court. Elevation of the portion of the end of the court on a larger scale, showing the great niche.